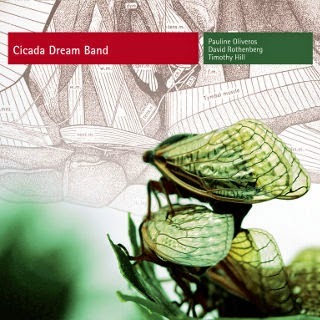 When we last heard David Rothenberg he and some friends were making beautiful Bug Music on his earlier Gruenrekorder release. 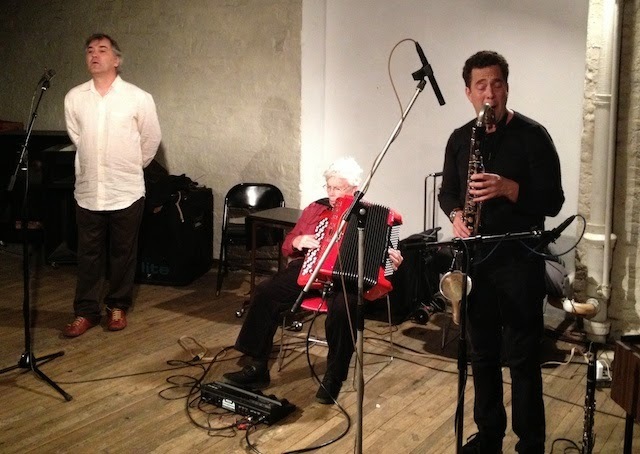 This new one finds him continuing along that unique path again in the company of vocalist Timothy Hill but joined also this time by the (as if you needed me to tell you this) accordion playing Pauline Oliveros. CDB is a similar sort of creature to it's successor, which is no bad thing, but this time out the instrument seem to be taking a prominent role in the recordings. Previously it seemed that Rothenberg was reacting to the insect's cavalcade of sound. Here the critters are more integrated into the music; as though the music was assembled around their exclamations. It works really well but it does seem more deliberate and, for lack of a better word, 'composed' (which seems unlikely to me) than the previous. It's a really lovely set. Rothenberg is centre stage and on fine form, Oliveros is a more withdrawn presence but her contributions are precise and work particularly well alongside Hill whose vocalisations are restrained and avoid the overt (and for me very annoying) vocal gymnastics that many avant-vocalists are prone to. Highly recommended and another in a long line of phenomenal releases from this eclectic and wonderful label.